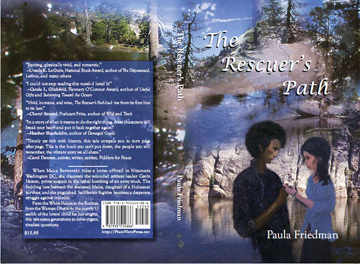 I’ll be reading from The Rescuer’s Path at the Ballard Library in Seattle on Feb. 9, with readings and booksignings planned for early spring in the Columbia River Gorge area and elsewhere. Contact paula@paula-friedman.com if you’d like to arrange a reading and/or signing for your reading group or organization. The Rescuer’s Path tells what happens, in Nixon-era Washington DC, when a Holocaust survivor’s young daughter discovers and aids a wounded fugitive, the half-Arab antiwar activist who is the prime suspect in the lethal bombing of a US Army truck. Overcoming hesitancies and distrust, the two young people become friends, fall in love, and flee cross-country, pursued by an implacable FBI. High in the Rockies, they discover each other’s depths of love and their own real courage, but the pursuit soon closes in. Three decades later, in the shadow of 9/11, the young couple’s birth daughter, raised by adoptive parents, searches for the truth about her origins.